On a site that was selected for a Presidential monument nearly 100 years ago, the Franklin D. Roosevelt Memorial was created and dedicated in the mid-1990s. The memorial is one of the newest, and most impressive, memorials along the Potomac. It occupies a prime position on the Tidal Basin, but is designed to blend into the background of the parkland setting. 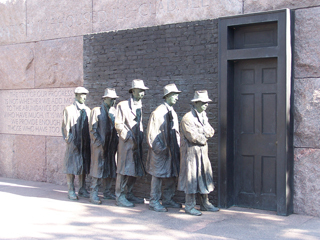 The FDR Memorial is 7.5 acres in size, made largely of 6,000 tons of granite and set up in a series of "rooms" that describe important periods in the life of FDR. A series of waterfalls and trees help with transitions from one room to the next. The rooms include the first Inauguration of Roosevelt in 1933; the Great Depression in the early 1930's; the Second World War; and the Seeds of Peace. Major events in FDR's life are carved into granite steps and stones; other sculptures depict people and events of FDR's four terms as president. The Memorial was designed by landscape architect Lawrence Halprin.